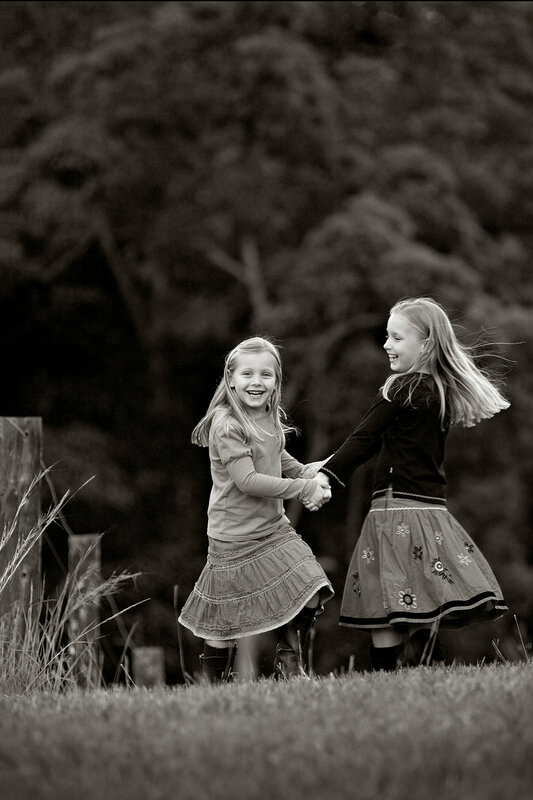 How to capture natural portraits of kids. There is always a positive reaction when asking girls to dance around. They love it and it can “break the ice“ very early in a session. Just find a simple uncluttered background that suits the light, get low and wait for the reactions between them. I shoot single-shot auto-focus and anticipate the moments and look for sequences. I don’t overshoot, but that’s my way of working. Just get the shots your way because they’ll love them. I always try and include objects such as fences, posts and walls when I can. These are great leading lines that enhance perspective and depth in a portrait. I’m positioned low and down the hill from the girls which has blurred the foreground. The trees in the background are dense and out of focus, caused by the compactness and shallow depth of field of the 200mm setting, so the girls really pop out.